Rabbit Loves Kim: Kim ? I tried a lot of kim. 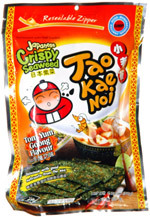 Some years ago, my favourite kim is Tao Kae Noi spicy one. it is salty ^^ i love salty foods. and it is so delicious when you eat it with rice together ! when i feel like don't like the vegetables available at my house, i will eat rice with kim only.. kkk. haha... so at last did you buy the candy sugar bag?